At some point the day comes when a plant gets sick and presents with unfamiliar symptoms. While it is possible to conduct exhaustive internet searches, it is unlikely that such searches are either efficient or result in an accurate diagnosis. For example, pests, bacterial and viral infections, fungi and environmental stressors all cause leaf distortion. However, the treatments for the critters and/or cruds causing the damage are vastly different. A more effective route to an accurate diagnosis is to get help from an expert and there are a lot of experts willing to help. Your local nursery professionals, extension agents, rose society consulting/master rosarians and master gardeners have specialized training and/or other resources to help with identifying pests and diseases in plants. Being able to see a large portion of the infected plant made the diagnose of Cercospora relatively simple. I find the most helpful first step is by sending photographs of the damage to your local expert. 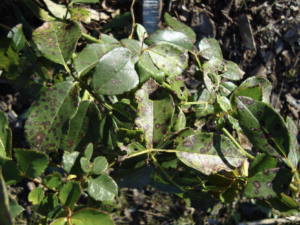 Ninety percent of the time, experts are able to diagnose plant maladies through photographs. Take several good, clear photos of the symptoms from at least three perspectives: (1) close up of the damage, (2) branch, stem or limb where the damage occurs, and then (3) step back and take a picture of the entire plant. Being able to see the “big picture” of what is going on in your garden allows us to give a more accurate diagnosis and also determine if perhaps there is more than one cause of the symptoms that you see. If symptoms are occurring on leaves, take photos of both the top side of the leaf and the underside of the leaf (sometimes damage will show up on both sides of the leaf). If the expert requests that you send or bring samples, PLEASE PLEASE PLEASE put those pieces of sick plant in a sealed plastic bag. Many pests and all infecting fungi are microscopic – so you may not realize that you are carrying the pest/disease pathogens with you to the expert. If the expert is a retail nursery professional or public garden curator and you walk in waiving around a branch infested with chill thrips, I promise you will not stay on the expert’s Christmas card list for long. What people may not realize is that when this happens, the retailers/public gardens have to start monitoring their plants for possible infections, and then initiate costly treatment regimes. These preventative measures end up costing everyone in the consumer chain. 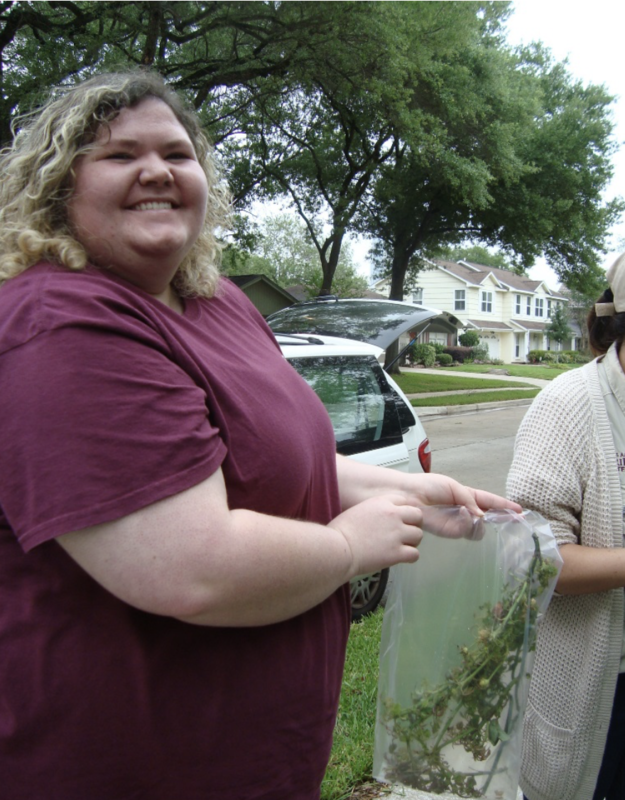 Students of Texas A&M bag suspicious plant specimens for lab testing. • Cut a representative section of stem containing the symptoms and place in a large plastic sealable bag. If the symptoms show up on plant leaves, also include some leaves from the infected plant that have no symptoms. This allows the experts to compare the differences between normal and abnormal leaves from the same plant. • Label the bag with your name, contact information, the county/state where the sample was taken, the type of plant (e.g. rose, hibiscus, etc.) and the date the specimen was taken. the chance that the pest/disease will be transferred on your gardening equipment. If you are sending plant specimens to a plant diagnostic laboratory that is part of a university, check online with the lab’s guidelines for receiving plant material. Many labs only test samples on certain days of the week and the timing of delivery of samples to the lab needs to coincide with their testing schedule. The American Rose Society has a huge network of consulting and master rosarians located around the country that are happy to help and inquiries can be submitted online through the American Rose Society’s website, www.rose.org. Click on “Find A – Consulting Rosarian” to submit your inquiry.